Witness the events that steal the innocence of a child, a child who befriends the assassin. Finally, be there when both meet once again twenty years later on opposite sides of the law. Readers have stated that they simply couldn't put the book down. 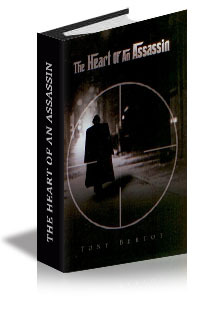 In the Heart of an Assassin Tony Ber tot left the readers wanting more as the characters came to life with the turn of each page. The Birth of an Assassin, is enticing, hooking the reader right from the get-go. It only takes one moment to transform an individual, but Theo Gresco, has been front and center in two such occasions resulting in lost innocence. They say that for everything that happens there is a reason. That cannot be more true than when Theo undergoes his transformation from an innocent child to a deadly and calculating assassin. The novel revolves around the rise of the Giordano and Costellino crime families. The Birth of an Assassin is set against the backdrop of two major U.S. cities%u2014Chicago and New York%u2014in the early 1940s, and spans nearly two decades, from 1942 to 1964. Finally, the climax; The Legacy of the Assassin. The twists and turns that make up the third book keeps you on the edge of your seat. You find yourself rooting for the assassin saying to yourself "They should never have gotten him mad." Readers biggest complaint; "They just couldn't put it down". In the Birth of an Assassin, the prequel to this book, you witness the rise of the two crime families and the events that made Theo an Assassin. In the Legacy of the Assassin it all comes to a climax as a contract is taken out on the Assassin as he now turns his attention to those that are now hunting him.